Among the top digital innovations, blockchain was always the ugly duckling. The internet of things, big data analytics, or machine learning applications, are pretty much set. You do not need to discuss the value potential. They are proven in the mill and mining space, through a number of POCs and broader implementations. The blockchain is an entirely different story, much earlier in the hype cycle, at least in our industry. This blog is a documentation of my own learning journey from zero to blockchain in one week. Much of this I owe to the support of Former Member who’s my personal guru on the topic. A primer – what is blockchain anyhow? Blockchain typically stores transaction and ownership information – like an ERP system, a ledger or a bank account. A relational db or an ERP system is typically with one company, at one location. The blockchain, on the other hand, it is a decentralized information storagebase. All partners share the same information in a peer-to-peer network. As all have the same information, Blockchain is good for sharing information across all interested parties. A good example for this would be land registry which holds information who owns which piece of land. Blockchain is hard to hack, or “immutable”. It holds an unalternable history (“chain”) of all transactions. It is near impossible to change entries once they are in the blockchain. You would virtually need to change encrypted books of every partner. Technically, this uses private/public key cryptography and hashing algorithms. Every new set of transactions (“a block”) contains a “checksum” of the previous blocks content. Blockchain is secure. All updates are agreed on betwee the peers based on a consensus algorithm. No one party can take over control and push their point of view. And most importantly, blockchain is programmable. This works through little programs called smart contracts. These programs enable automativ execution of transactions upon meeting predefined criteria. A good example for this, is triggering an automatic proof of delivery to a supplier when a truck enters on my grounds. The name “blockchain” describes 2 of those essential ingredients: Transactions are recorded into little bundles, called “blocks”. Think of a posting of money from my account to your account. In a normal relational database, it is common to change or update records. In blockchain, you can only append further blocks at the end of the chain. Each transaction makes the chain a block longer, one chain-link at a time. Distributed ledger technology is often used as a synonym for blockchain. I still did not figure out the difference. (I believe there are other DLTs tother than blockchain that I never heard of). The term is less common, but still good to know. It highlights a key feature of blockchain: it is distributed across all peers in the network. This is important to remember when you verify whether a use case is a good fit for blockchain: If only one company is involved, you do not need blockchain. If you do not need to share information across companies or peers, you most probably do not need blockchain. A key advantage of the distributed ledger is that information can be shared across all peers, without the need of an intermediator. Take the exampe of bitcoin. You can transfer money directly from A to B without a bank in between. Are blockchain and bitcoin the same thing? Blockchain is the underlying technology of the famous crypto-currency bitcoin. But blockchain can be used for many more applications, and the biggest interest of corporations is rather on those, and not on bitcoin itself. Need a primer on Bitcoin? Hear John Oliver from The Late Show on cryptocurrencies. Smart contracts provide are a key value driver for blockchain because of the automation potential of cross-company business processes. They are also somewhat “uncharted ground”, at least legally. Currently, they are treated by legislation rather like programs or code, and not like “real”, legally binding contracts. There’s a good Economist article by Schumpeter “Not so smart contracts” outlining some of the problems behind smart contracts; just one quote here: “if code is law, so are bugs in the code—and correcting them may itself mean a breach of contract.” The legal & auditing unclarity around blockchain technology is one of the bigger obstacles for wider adoption. You may have heard in the news that bitcoin “mining” consumes incredible amounts of energy. This is due to the ways parties acchieve “consensus” on the next block to add to the chain. Some consensus algorithmis require solving incredibly complex cryptographical calculations, like with bitcoin, and those give you the high electricity bill. Other algorithms do not have this problem; thus blockchain is a viable technology also for the enterprise context. There are two major options to deploy blockchain. Either you have a public or permissionless blockchain, like e.g. bitcoin. Everyone can join. Or you rather have a closed consortium of companies, and then you talk a bout a consortium or permissioned blockchain. Nearly in all enterprise contexts you would like to have control over with whom you share transactional data, and therefore typically go for a consortium blockchain. Besides these most common options there are also private blockchains. One single organization controls who can read, submit transaction or participate in consensus. This is fully centralized, thus loosing most of the blockchain benefits. This may be useful for a sandbox, not for productive use. Semi-private blockchains are run by a single company that grants access to any user satisfying pre-established criteria. This is still not really decentralized, but has somme applications for some B2B use cases, especially in public service and government. What makes blockchain technology interesting for business? Process optimization: Multiple parties share the same single version of the truth e.g. all relevant parties know about the content and the ownership of an ocean liner’s content. Time & cost reduction: Faster processing in multi-party scenarios as there are no intermediaries, no limitations by office hours, or waiting for physical papers to arrive. A bitcoin money transfer takes minutes. If multiple banks are involved, we talk about days. Imagine the same for port or customs operations. transparency about status & changes. Risk & fraud minimalization: Remember the smart contracts, automated and provable business rules. Think also of the provenance of a diamond or a expensive sparepart. You can rely on the information of origin and authenticity. Security: The distributed and encrypted nature of blockchain make if hard to hack. An interesting use case in this context is a tamper-proof registry & identification of all IoT devices in a network. There are many potential and already realized use cases for blockchain. Some are industry-agnostic, other are very mining specific. In my opinion, the most straight-forward use cases in mill products, are in multi-party logistics and in asset management. Many parties play a role in a single international trade, such as a seller (shipper) and buyer (consignee), their banks (export, import, correspondent banks), freight forwarders, carriers and lot’s of authorities (customs, taxes, security, ports, etc.) and all do have their own systems with their own truths. Many created peer-to-peer interfaces, many communicate via e-mail or fax. In order to “proof the truth” paperbased original forms with stamps and signatures are exchanged and shipped by means of express courier services (UPS, DHL Express, Fedex etc.). The handling and shipping of papers imply a significant portion of the total costs of “logistics”. Before my time at SAP, I have worked in the cross-border logistics of a relief agency during the Yugoslavian wars. Obtaining the right stamps at the many customs offices was a huge strain on my nerves, and an automated paperless process an unimaginable dream. But even in non-war times international trade is error-prone. A key document in this process in the bill of lading, a paper based document issued by the ocean carrier. It is used in international trade as title of goods. Basically, it is a proof of ownership of the goods.The holder of the original(s) is the owner of the freight and is the only one entitled to pick up the container from the port of discharge. (Check out the linked example when a few containers of valuable cobalt briquets where picked up by the wrong person). The ownership of the freight can change while the vessel is still on its way, and as the freight can’t be handed over, a “negotiable” bill of lading can be handed over instead. SAP has shown a proof of concept for this logistics blockchain at 2017 TechEd. Check it out for yourself in this YouTube video. A more mining specific view on this, has been shared in the Global Mining Standards and Guidelines Group. This use case is related to the asset itself, and it’s spare parts. Imagine buying a used car, and having a tamper-proof history of all maintenance and repair events. Same goes of course with larger “second hand” assets. The blockchain makes the history of the asset available to all parties involved, a potential buyer, a contractor providing maintenance services, and the owner itself. For spare parts, this more about proof of product authenticity and copy protection, especially relevant for high value parts . A very similar use case is the “new generation end of lease process“, a customer POC with WASL LLC Dubai, around real estate property management & collaborative scenarios between service engineers, contractors, tenants and property managers. If you think about the journey of a diamond, from when it’s mined, sorted and sold, to when it is mounted and displayed at a trusted retailer, say Tiffany’s or Harrods, there is so much opportunity to exchange a valid diamond for something of different provenance, like a blood or conflict diamond. Using the blockchain, each step of the production process can be verified, guaranteeing the legitimacy of a diamond. London-based start-up Everledger, in partnership with IBM, have implemented a verification process for diamonds at each link in the supply chain. The technology enabled diamond suppliers (and intermediaries like border agents) to replace a paper certification process with a blockchain ledger. The process involves using computer scanning tools to access what Everledger calls a “digital vault” and to determine the provenance of any diamond. The company tracks diamonds using 40 unique metadata points, the laser inscription on the girdle, and the stone’s four Cs—color, clarity, cut, and carat weight. These digital thumbprints would then be written on the blockchain. Master certificates of the Kimberley Process certified rough diamonds are also digitally stored on the blockchain. Find more mining use cases for blockchain in this excellent blog by Bharti Maan “Blockchain adoption – use cases for mining industry“. This is admittedly not really mill specific. But it’s dear to my heart. Working for a relief agency in a war or disaster zone, you need a simple system to know about needs and available capabilities and relief goods. We used to call other agencies to share “overcapacity” or to ask for urgently needed materials e.g. vitamines or improvised building materials. A simple “marketplace” build on blockchain without an intermediary would have been a great benefit at the time. Today I read this announcement on Greenpeace leaving the Forest Stewardship Council. The NGO is concerned that FSC practices “inconsistently implemented its traceabilty standards and fell short of its goals to conserve forests”. Greenpeace complains that FSC fails where “high risk regions where democratic and civil society institutions are weak and corruption is high”. Would blockchain help here? Blockchain could create a tamper-proof digital chain of custody. The tricky bit is the physical world. With the Everledger example, each diamond was marked and uniquely identifiable. Thus, it was possible to uniquely link a phyical diamond to its digital trail of ownership. This has obviously not been done in the case of FSC. In short, you will need to ensure that the physical and the digital world are unseparable. One could ask: where’s the undo-button? A typical aspect of business transactions is the possibility to revoke and cancel e.g. an incorrectly posted goods receipt. Blockchain inherently does not allow this. Instead you would need to add a reversal posting to the chain. With transactions, this may not be a grave problem. Just recently, researchers from RWTH Aachen downloaded the entire Bitcoin blockchain and discovered “objectionable” content in the non-financial data. “Since all blockchain data is downloaded and persistently stored by users, they are liable for any objectionable content added to the blockchain by others. Consequently, it would be illegal to participate in a blockchain-based system as soon as it contains illegal content,” the researchers explain the issue. Digital Trends explains that only 1.4% of all Bitcoin blockchain transactions contain such non-financial data. But the problem needs to be addressed to avoid legal issues. SAP provides on the SAP Cloud Platform a Blockchain-as-a-Service offering (help.sap.com). This allows companies to e.g. extend an S/4 based business process through the SCP BaaS into various blockchains. Other companies may use different connection methods, but will collaborate on the same blockchain. SAP Asset Intelligence Network: Blockchain will be explored to further increase the trust level across multiple business partners for collaborative asset management processes, such as audits or asset tracking and provenance. SAP Distributed Manufacturing: A network-based application providing a private and secure platform for collaborative 3D printing between service suppliers, material providers, OEMs and technical certification companies. Blockchain will be evaluated to streamline the collaborative manufacturing process. I would recommend to regularly check the roadmaps for further information. Enough of theory. You can get started immediately with the SAP Blockchain Early Access Program, and become part of the SAP community of customers, partners, and SAP experts. Let us know of your journey, and your favorite use case in mill or mining. 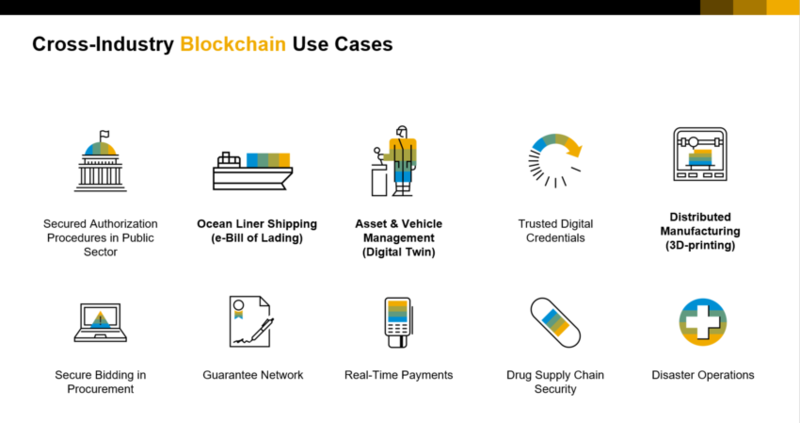 I also like the discussion in “Business Opportunities and Caveats of Blockchains” in the SAP Community (Part 1 and part 2) that look beyond the hype and ask a few smart, technical questions.